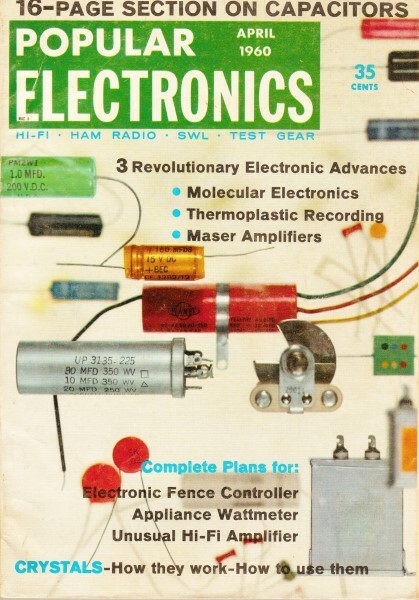 Here is a nifty little exercise that appeared in the April 1960 edition of Popular Electronics. It has 10 different light bulb circuits and challenges you to figure out which bulb would burn the brightest. All are intuitively obvious to most of us who have been in the field for decades, but do you remember how to do a circuit mesh analysis to prove your "gut," as the Donald would say? If you resort to building any of the circuits as a lab exercise, be sure to not use incandescent bulbs greater than 60 watts or the green police could could be paying you a visit. 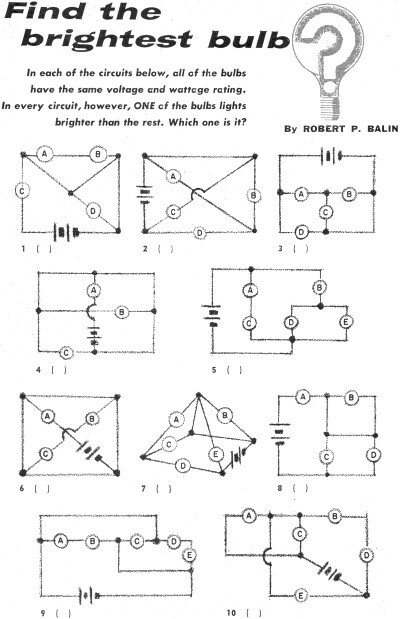 When analyzing the circuits, note that for many of the branches one side of the bulb returns directly to the battery, even though at first look it might appear to share with another branch. In circuit 3, for example, you can redraw the circuit connecting the left sides of bulbs A and D directly to the positive battery terminal (anode). Similarly, the right sides of bulbs B and D and the bottom of bulb C directly to the negative battery terminal (cathode). Bulb C is the only one that has the full battery voltage across it. Bulbs A, B, and D are shorted across their terminals and thus have no voltage across them. Bulb C is the only one that has the full battery voltage across it. Bulbs A and B share the battery voltage with bulb D.
Bulb D is the only one that has the full battery voltage across it. Bulbs B and C share the battery voltage with bulb A.
Bulb A is the only one that has the full battery voltage across it. Bulbs B and C are shorted across its terminals and therefore have zero volts across them. This one is a bit tricky, as with circuit #5. 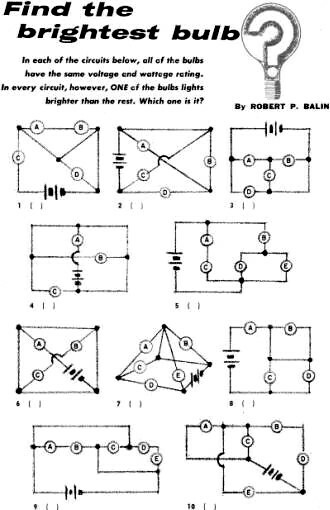 Bulbs A and B are in series and therefore share the battery voltage equally Bulb A is in series with the parallel combination of bulbs D and E. The intent of the author is likely that you treat the bulbs as resistors and therefore the parallel combination of bulbs D and E result in half the total resistance of a single bulb. Therefore, the voltage across those two bulbs would be Vbatt * (0.5Rbulb / 1.5Rbulb) = 1/3*Rbulb, and the voltage across bulb B would be 2/3Rbulb. For standard incandescent bulbs, the operational resistance is dependent on the voltage across the bulb, so the voltage division would not be as clean-cut as that, but still bulb A would be brighter. If the bulbs were neon types that maintain a fairly constant voltage across their terminals and regulate current to maintain the voltage, then provided the battery voltage is high enough, all three bulbs would burn with equal brightness. This is essentially the same circuit as #4. Bulb E is the only one that has the full battery voltage across it. Bulb B's terminals are shorted and thus 0 volts across it. Bulbs A and C share the battery voltage with Bulb D.
This one is a bit tricky, as with circuit #5. Bulb B is shorted so it plays no role. Bulb A is in series with the parallel combination of bulbs C and D. The intent of the author is likely that you treat the bulbs as resistors and therefore the parallel combination of bulbs C and D result in half the total resistance of a single bulb. Therefore, the voltage across those two bulbs would be Vbatt * (0.5Rbulb / 1.5Rbulb) = 1/3*Rbulb, and the voltage across bulb A would be 2/3Rbulb. Bulb C is the only one that has the full battery voltage across it. Bulbs A and B are in series with each other and therefore share the battery voltage. The same goes for bulbs D and E.
A quick mesh analysis, assuming the resistive model for the bulbs, shows that the current flowing through bulb E is one unit of current while the current flowing through the other bulbs is 1/2 unit of current. That means bulb E would be the brightest.